Initial patient assessment in home health can be tricky. If documentation does not adequately provide a reason for skilled nursing care in the home, you might not get reimbursed at all. 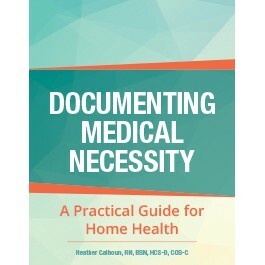 In Documenting Medical Necessity: A Practical Guide for Home Health, author Heather Calhoun, RN, BSN, HCS-D, COS-C, provides down-to-earth, conversational documentation tips with dozens of example scenarios to help nurses understand medical necessity and document in a manner that encourages proper and complete reimbursement. In addition to initial assessments for skilled services, continued skilled care must also be properly documented. This resource will help nurses provide skilled services based on critical thinking throughout the continuum of care. Heather Calhoun, RN, BSN, HCS-D, COS-C, is the education director for Home Health Solutions, LLC, and has been in the homecare industry for the past 20 years. She received her BS in nursing from the University of Alabama in Birmingham in 1992. She has extensive field and case management experience in both home health and hospice. Calhoun has held various positions in home health and hospice agencies such as performance improvement coordinator, staff development director, and appeals auditor. She has extensive knowledge of state and federal regulatory guidelines.